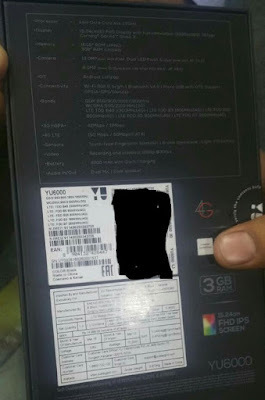 We reported back in November that YU is testing a device with codename YU 6000 now images have surfaced indicating that device is already available in offline stores. The device which was expected to be YU Yuphora is actually titled YU Yureka Note a successor to Yureka and Yureka Plus. The specifications of the device matches the specifications of YU6000 as revealed in GFXBench listing back in November. In the first it looks like a pretty decent Phablet with good specifications. Though the price tag of ₹14,999 looks a bit ambitious. There is no word from YU when this device will be officially launched or whether it will be available online through Amazon or it is an exclusive for offline stores. We'll update when there is any confirmation from YU. It should also be noted that around 20000 units of YU6000 have been imported by YU last month indicating the imminent launch and somewhat confirming the authenticity of these images. The naming of YU6000 as Yureka Note also calls to question about the existence of YU5200 which has been called as Yureka and Yureka Plus successor. All of this confusion will clear once we hear from YU Team. Tell us about your thoughts on this newest phablet by YU. What do you think about the price as well as specifications of the device. Would you be picking this device once launched. Why or why not. Leave your comments below and don't forget to follow us on FB for more YU related news.